Cut to the cake! Planning out the details for your wedding cake and sweet table can be one of the most fun activities of planning your wedding. Who doesn’t look forward to a piece of creamy delicious wedding cake, beautiful macaroons or fancy cupcakes at a wedding? This can also be one of the easier parts of planning as all you have to do is envision what kind of desserts you’d like to have at your special affair, and then leave it up to a professional baker to turn it into a delectable reality! Here are some appealing cake and sweet table ideas and trends for 2015 that really, well… take the cake. Personalization is starting to become a major trend for this year as more couples are choosing to make a statement through various aspects of their wedding, especially though the food. Go with desserts that represent you as a couple and are unique to your likings and personal fancies. Subtle touches, such as sugar butterfly cupcakes or a cake design that fits excellently with your overall theme is all you need. Have fun with personalization. You want guests to admire the thought and effort that you put into making your wedding aspects reflect who you are. This year we will see more couples experiment more with brave, bold flavours for their cakes and desserts. Couples are choosing to take a break from more customary flavours like French vanilla and red velvet and going for rich, indulgent tastes like caramel cake with salted caramel buttercream, and chocolate orange cake with Belgian chocolate orange ganache. Don’t be afraid to try something new! Bakers and caterers are more than willing to let you sample their delicious creations, and if you love it, chances are your guests will love it too. Pantone has just recently set the “color of the year” and the hue goes to *drum roll please*: Marsala! Marsala is a warm mix of brown, red and burgundy that has the benefit of being bold but soft at the same time. Trend-savvy couples will infuse this warm hue into their cakes and sweet table desserts, for some cake artists, it may be difficult to create the exact colour of marsala, but combining dyes of red, brown and burgundy should give you the perfect marsala. Don’t forget to include red, dark wine at the wedding to give a nod to your marsala theme! Metallics stand bold and loud on cakes and the beauty of them is that not only do they look luxurious but they go well with almost any colour you combine them with. Gold is warm and beautiful, and makes for a super polished look on your cake. Rose gold is just as warm and shiny, just with a dash of beautiful pink. Lastly, silvers are in as well and they definitely give that shiny lustre to your confections, looking modern and chic as well. Play with your favourite metallics and let them do the statement making at your wedding. 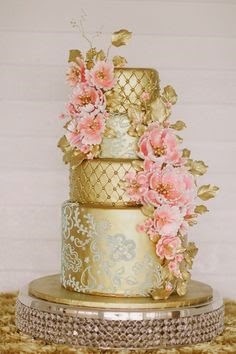 A gold chevron-style tiered cake? Rose gold macaroons? Glamourous cupcakes with silver fondant accents? Metallics will look grand on anything on your sweet table. 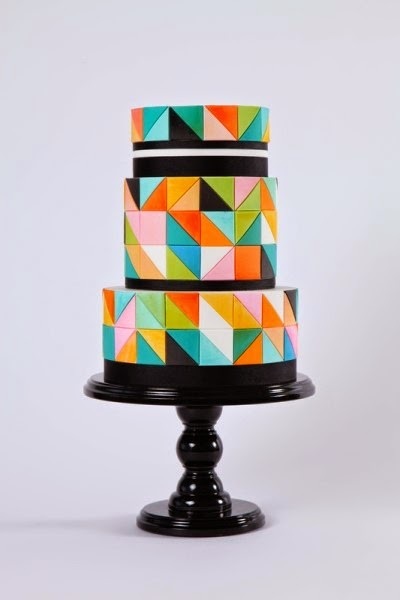 Geometric shapes for décor and cakes have been popular for a few years now but are now making a bold comeback for 2015. Not only is this such a bold and fun idea, but using geometric shapes on your cake and other desserts is a great excuse to use pops of colour! “Geometrics are extremely versatile and can be translated into so many different designs and themes. Small uses of geometric shapes can transform a typically traditional design into something fresh, modern and unexpected.” –says Stevi Fransen-Auble. Use shapes like triangles, hexagons, squares and other quadrilaterals (am I taking you back to math class?) to experiment in making the shapes have high design and bold impacts. For other fab style ideas and trends to watch out for this wedding season, visit our website at www.fabfete.ca or get in touch with one of our fabulous planners!